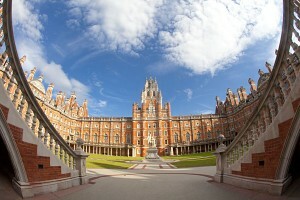 Royal Holloway. Enjoy the wedding reception you’ve always dreamed of in the divine setting of The Founder’s Building, Royal Holloway, an exceptional venue that will provide special memories from the welcome through to the catering. As well as the beautiful surroundings, from the wonderful Founder’s Building to the impressive grounds, Royal Holloway provides the very best in individually tailored wedding packages, so you can really experience the day you have always dreamed of.